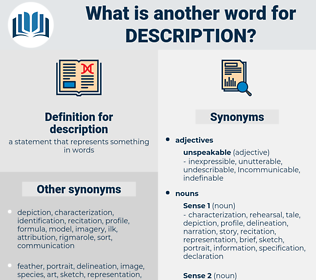 What is another word for description? depiction, portrayal, characterisation, delineation, specification, characterization. observations, comments, responsibilities, allocations, Regulations, matters, Guidelines, points, Stories, organisms, remarks, powers, Budgets, Duties, data, Bodies, Agencies, designation, designations, Bureaux, annotations, goods, Describing, described, outlines, definition, definitions, overview, purpose, purposes, presentation, presentations, descriptive, DESC. articles, applicants, Maps, denominations, Stories, designation, designations, annotations, outlines, descriptive, terms. discuss, vitae, data, designation, appellation, qualification, quotation, exposition, clarification, described, illustration, definition, definitions, discussion, overview, elaboration, enumeration, articulation, estimate, formulation, purpose, demonstration, mention, significance, presentation, descriptive, version, narration, snapshot, nomenclature, adjective, succinct, disclosure, representation. demonstrated, defined, Indicated, Indicating, specified, Explained, illustrated, suggested, proved, Accounted, Stipulated, appointed, reflected, expressed, Gave, showed, designation. reasoned, identified, nominated, written, appointed, assigned, chosen, woven, named, designation. demonstrates, presents, indicates, specifies, illustrates, Addresses, contains, suggests, includes, covers, proves, reflects, implies, reviews, sets, deals, underlines, highlights, says, looks, shows, marks, means, points, remarks, annotations, outlines. Some also, terme this particular description of places, Topographie. There were sixty people on board, a large number for a vessel of that description. 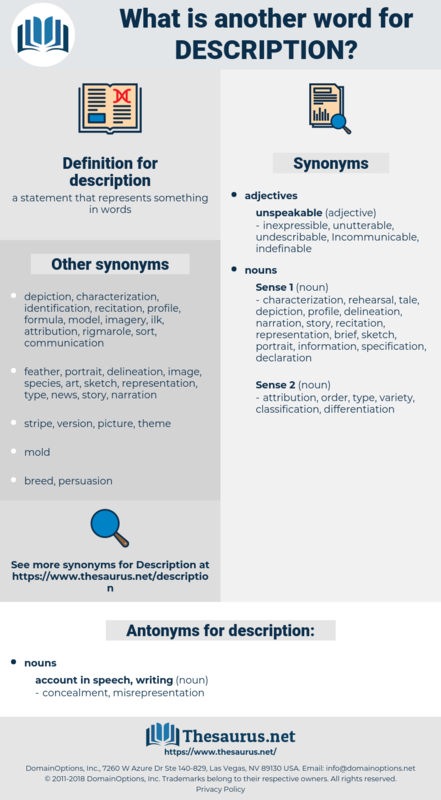 characterization, sketch, word-painting, detailing, particularization, depiction, label, word picture, picture, spec, characterisation, specification, particularisation, job description, vignette, delineation.